The March 2013 C-IMAGE research cruise is about to begin. Rough seas have delayed our original departure date of Friday, March 22nd. However, the Florida Institute Oceanography (FIO) operators project a possible go ahead for a late afternoon departure on Monday, March 25th. As anxious as we all are to head out to sea, we need to always put our safety and the security of the ship and the equipment first. Using Google Earth to see the sampling sites for the March 2013 C-IMAGE expedition. Geographic Area. 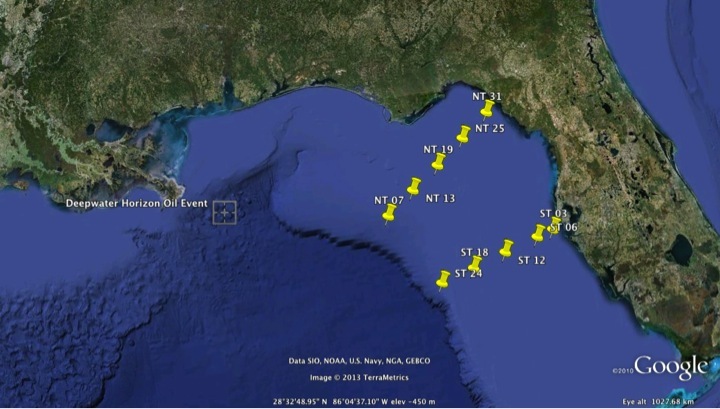 We will collect measurements at stations along two transects on the west Florida shelf (see above). One transect extends out from Tampa Bay (~10 m to 860 m on the shelf/slope) and the other transect extends from the Big Bend area out to the shelf/slope. There will be five primary interdisciplinary CTD stations on each transect at ST 03, 06, 12, 18, 24, and NT 07, 13, 19, 25, and 31. Under the leadership of C-IMAGE Scientist, Dr. Kendra Daly (http://www.marine.usf.edu/zooplankton/) C-IMAGE continues its offshore surveys of the Gulf of Mexico. Researchers from the College of Marine Science/USF and RSMAS/University of Miami will assess the impact of oil on Florida marine ecosystems by comparing non-impacted west Florida shelf and impacted north Florida shelf sites. This cruise will focus on coupling in situ and shipboard analyses of physical and chemical parameters, with biological studies of toxicity, microplankton community health, and the abundance and distribution of plankton. Our Science Party includes Chief Scientist, Leslie Schwierzke-Wade (USF), Karen Dreger (USF), Jonelle Basso (USF), Sharien El-Tourkey (UM), Matt Flynn (Eckerd College), Tess Rivenbark (USFSP Honors), Teri Deardorff (USFSP Honors). Determine community production and respiration rates from oxygen and DIC changes, and assess primary production from 13C incubations. A Teacher at Sea will join the science party, adding an education and outreach component via ship-to-shore communications (blogging and Skype). 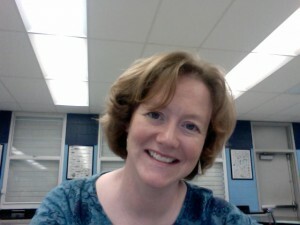 Susan Cullum teaches at Wesley Chapel High School (WCHS) in Pasco County, FL. This is her 9th year teaching at WCHS where she currently teaches Marine Science Honors, Biology, and Dual Enrollment courses in Oceanography and Environmental Science. Susan is not new to science research, she holds an M.S. in Marine Biology from U of Maine and a B.S. in Marine Science from U South Carolina. She looks forward to the research cruise to expand her hands-on experience doing scientific research, the opportunity to take these experiences back into her classroom and integrate them into her instruction. Please check in regularly to learn about the science that is happening aboard this research cruise! Susan Cullum would also love to Skype with classrooms to help bring these exciting adventures directly to you! If your classroom or group would like to participate in a LIVE video conference via Skype during our expedition, please contact Susan Cullum, scullum@pasco.k12.fl.us for details. Print article This entry was posted by greely on March 22, 2013 at 2:56 pm, and is filed under Oceanic Updates. Follow any responses to this post through RSS 2.0. You can leave a response or trackback from your own site.